In this short essay (not available free online), James Wood reflects on his late father-in-law's four-thousand-volume personal library, doubting whether one's books really say anything profound about oneself, and musing on the emotion-laden task of dispersing a departed loved one's collection. Though the words "iPad" and "kindle" are conspicuously absent from this essay—perhaps because Woods wished, consciously or not, to present his reflections from a pre-digital perspective—it's hard to avoid thinking that the onset of the age of the e-book is what makes Wood's piece especially poignant and autumnal. How will we pass on our e-book libraries to our children and grandchildren? We don't actually own our e-books—we only purchase a digital license—so we don't have the ability to freely lend, bequeath, or re-sell them to others, as we do with "real" books, which we own outright. And will e-book formats even remain viable in the longterm? 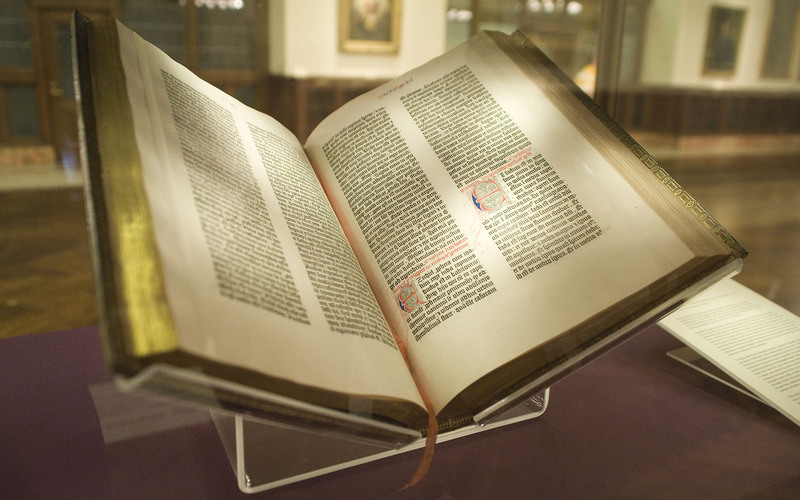 (You can still read a Gutenberg bible today, more than five hundred years after its publication.) Or will they soon become obsolete, requiring us to repeatedly re-purchase the same books in new formats, as we did with recorded music?